Every object - single or stack - is represented by its own window. This window offers a multitude of ways present the object. Change histogram on the fly. View the whole stack at once or play the stack members, one at a time. Every operation of ImageLab can be scripted in several scripting languages. Scripts can be constructed automatically from the object's history file. Several objects can be organized into one stack object. Mosaic builder with snap-in functionality and automatic intensity adjustment. Use automatic alignment to correct misalignment of image stacks taken through stereo microscopes. Use the Volume Viewer or intensity plot to present 3D stacks. Remove noise using a wizard. ImageLab offers very fast implementations of the Richardson-Lucy and Maximum Entropy deconvolution algorithms. ImageLab offers several morphological operations. 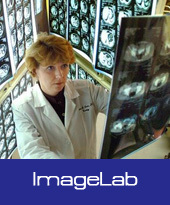 ImageLab offers advanced adaptive histogram equalization. Every image can have its own mask. This mask is not binary but continuous. The associated mask modifies every operation on the image. The resulting image is a mixture between the original image and the unmasked result. Interactively change the FFT and view a preview of the resulting IFFT image. Suppress wrap-around artifacts by applying windowing prior to deconvolution (image restoration). ImageLab offers deconvolution coupled to PSF generation. This way you can interactively find the best PSF approximation. Run your Matlab code unaltered within the ImageLab environment. You can also give your legacy code a new user interface with minimal change. ImageLab offers several ways to identify the PSF. Every object keeps track of its complete history. Use homomorphic filtering for contrast compression. Basic painting toolbox with layer support. ImageLab supports Mono (16bit), HSI (16bit), RGB (16bit and 8bit), Lab(16bit) and XYZ(16bit) color space.